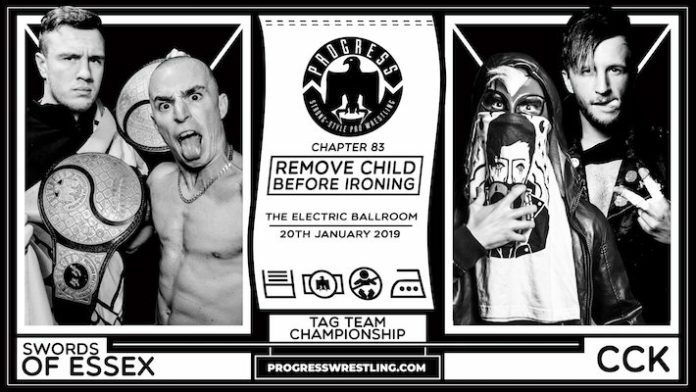 PROGRESS has announced that Will Ospreay will once again be returning ‘home.’ The current NEVER Openweight Champion in New Japan Pro Wrestling will be taking part in the 83rd Chapter event ‘Remove Child Before Ironing.’ This takes place on 20th January from the Electric Ballroom in Camden, England. Ospreay recently returned to the company for the ‘Unboxing’ event in December. Unboxing is a completely unannounced show where anything can happen. The ‘Aerial Assassin’ appeared to join his Swords of Essex teammate Paul Robinson to win the PROGRESS Tag Team Championships. The Essex based team defeated Aussie Open’s Kyle Fletcher and Mark Davis. Ospreay and Robinson will once again be teaming when they take on CCK at Chapter 83. CCK consists of Chris Brookes and Kid Lykos, one of the most revered and tenured teams on the UK circuit. This was one of the first announced matches for the show and could easily be the showstealer.